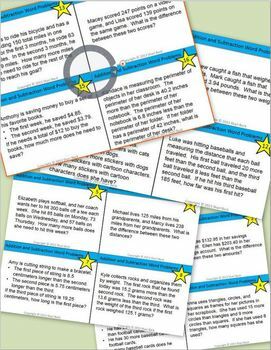 Addition and Subtraction Task Cards in a word problem format contain 16 different cards for Grade 5 based on the Common Core State Standards (5.NBT.B.7). These Addition and Subtraction Task Cards in a word problem format also satisfy the Texas TEKS 5.3(A) Objective. 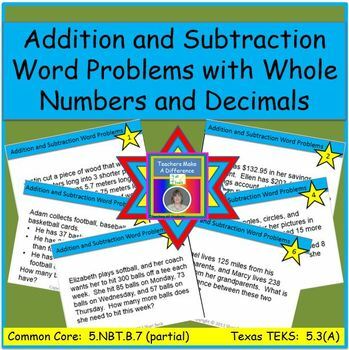 An Addition and Subtraction Task Cards Title card, a Common Core Standards card, a Texas TEKS card, and an Answers card are also included if you choose to make them part of a deck. A full size page of answers are included to use in a learning center, and a full size page of answers with cover cards containing windows to reveal a correct answer are included if you choose to let students play a group game. The cards can also be used at the end of Grade 4 or as a review in the beginning of Grade 6. 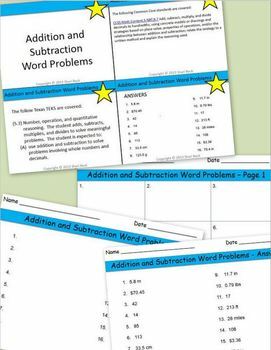 Addition and Subtraction Task Cards in a Word Problem format help with understanding how to first decide which operation of addition or subtraction is necessary based on the written words of a problem and then focus on the skill of adding and subtracting both whole numbers and decimals.